An anti-epileptic and natural relaxation agent located in the brain, GABA (gamma-aminobutyric acid) is in fact one of the most important regulators of neurotransmission and essential functions of the body. It would seem that those who suffer from anxiety, insomnia, epilepsy, as well as other brain disorders do not produce a high enough level of GABA naturally. That is how drugs such as Valium, Baclofen, Valproate and Neurontin work – by causing an increase of GABA production in the brain. Unfortunately, these drugs all have a plethora of side effects that they can cause as well as being potentially addictive, making them a poor solution for long-term use. On the other hand, natural GABA (non-synthetic) is much safer and incredibly effective with minimal side effects. Natural GABA can be a powerful aid in conquering stress and stimulating relaxation. Another benefit is that it can negate the effects of caffeine. For information on supplementing GABA, please check out my post on the best GABA supplements to take. How exactly does GABA work? 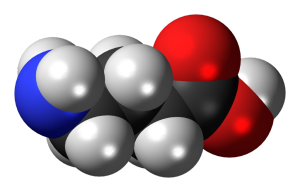 Gamma-Aminobutyric Acid serves as a neurotransmitter in a person’s central nervous system (CNS). GABA inhibits nerve transmissions in the brain, which alleviates nervous activity. Made from glutamate in brain cells, GABA works as an inhibitory neuotransmitter – in other words, it blocks nerve impulses. Glutamate is an excitatory neurotransmitter and when it connects to nearby cells, it causes them to activate and send a nerve impulse. GABA on the other hand does the opposite – when it attaches to another cell, it tells it to stop and not to send an impulse. As such, with a deficiency in GABA, nerve cells can fire easily and far too often. This can cause various anxiety disorders such as seizure, panic attacks, headaches, Parkinson’s disease, and impairment of cognitive abilities to name a few. A deficiency can also cause depression, insomnia, anxiety, and epilepsy. These are all related to a lack of GABA in the brain. GABA blocks the transmission of nerve impulses between neurons, bringing a calming or relaxing influence. An easy way to understand what it feels like to have a deficiency of GABA, think about what happens if you consume too much caffeine. Caffeine will inhibit GABA release in the brain. That means that more nerve impulses will fire since there is not as much GABA holding it back. The jittery, restless, hyperactive feeling you get is what it’s like to have low GABA levels. When GABA is sold in a supplement or pill form, it is generally advertised as a natural tranquilizer for the body. It is also promoted as increasing the body’s human growth hormone (HGH) levels, which makes it a popular supplement among bodybuilders. For more information about GABA, be sure to check out the links in the top menu for additional details.